The New Year has rolled around again, and that means it's time for another New Year's resolution. What do you mean you are supposed to make those before the second week of the month? In clear "me" fashion, I am a little late starting with my resolution, but it is once again to lose some weight and get healthy. I honestly just want to be able to run and play with the boys without being winded. At this point, it is more about them than me. So, I have been enlisting the help of some information and resources to help me succeed in keeping my resolution this year. As silly as it might sound, the number one tool in my arsenal for keeping my New Year's resolution is a pack of gum, the new Juicy Fruit® gum with Starburst® Flavors to be exact. I loved Juicy Fruit® as a kid, and now as an adult, it is helping me achieve my goals. Now, can gum help you lose weight? Probably not, but what it does for me is helps suppress my appetite. See, I eat when I am board or just want to chew on something, so gum helps me feel that need for just 5 calories per piece! 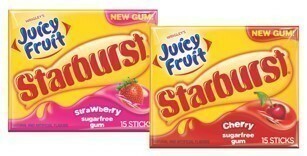 New Juicy Fruit® with Starburst® Flavors came out in December, and are available at Target in both strawberry and cherry flavors in either a 15 stick single pack or three count of packs. I have been snacking like a villain lately, so when I was at Target the other day getting in on the Christmas 90% off clearance, I picked up a three pack of gum. I love the real Starburst flavor that is packed into each stick of this gum. When I first tasted it, I could have sworn I put a Starburst candy into my mouth instead of a stick of gum. Now, when I feel the munchies come on not long after eating a meal, I grab a glass of water, and pop a stick of Juicy Fruit® gum in Starburst® flavors in my mouth, and it helps me keep from eating everything I shouldn't. With just 5 calories per stick, I'm not sacrificing a lot. Want to try the all new Juicy Fruit® with Starburst® flavors, you can Save Now at Target! Want to know how else I avoid being a junk food villain, leaving hoards of candy and cupcake wrappers in my wake? Fight hunger list a superhero using the handy dandy chart above! These look good. I like these brand mixing ideas because they keep things new and different. The two best flavors too! I love Starburst, my favorite also are the tropical ones. Going to have to look for these. Believe it or not gum is also my secret weapon too! I like all flavors and dont think I have seen the starburst yet here but will look for it. Chewing gum really does do the trick and reminds you you dont have to be snacking on something. Least for me thats whatt happens! I love strawberry starburst so I am excited to give this gum a try. I will have to look for it the next time I am at the store. These are definitely a couple of my favorite things, so I'm glad they combined! I bet this gum tastes so good! The make this in gum now! My son and I would love to try out the new Starburst gum. It sounds like it will taste very good. I will have to get some next time at the store.